Google is splitting Hangouts into two separate apps, Hangouts Chat and Hangouts Meet. Hangouts Chat is a channel-based messaging app in the same vein as Slack Solid Tips to Master Slack & Be the Most Effective Employee Ever Solid Tips to Master Slack & Be the Most Effective Employee Ever Don't have a strategy for managing Slack? It's time you got one. You can't let Slack do all the work for you. Try these tips to make effective use of Slack. Read More , while Hangouts Meet is a video conferencing app for up to 30 people at a time. Which all sounds great, if not a little confusing. Google has quite a history with apps designed to help us all communicate better. There was Google Talk, Google Voice, Buzz, and Google+. Then came Google Hangouts, before Allo and Duo joined the party. And now Google has added Hangouts Chat and Hangouts Meet to the mix. Hangouts Chat is Google’s new idea for direct messaging. Team members create virtual rooms to hold conversations in, with threaded conversations allowing anyone and everyone to follow what’s being said. Both Google’s own services and third-party services will be integrated into the app. Google calls Hangouts Chat an “intelligent communication app for teams”. Which is also a description you could apply to both Slack and Microsoft Teams. We’re not saying Google copied anyone’s homework, but it’s fair to say Hangouts Chat was at least inspired by Slack. Hangouts Meet is a lightweight video conferencing app 9 Free Video Conferencing Web Apps -- No Registration Required 9 Free Video Conferencing Web Apps -- No Registration Required Who has the time to go through hoops? Quick collaboration is the name of the game. These nine video conference tools bring ease of use to help with your productivity. Read More . It supports up to 30 participants at a time, with everyone joining through a shared link without the need to log in to an account. Thanks to the Web RTC standard, anyone using Chrome or Firefox doesn’t even need a plugin. Video conferences can be arranged using Google Calendar, with anyone invited able to join simply by tapping the calendar entry. Even those who aren’t invited to a meeting can “knock” to ask to join. Enterprise customers will get a dedicated dial-in number making it even easier to get involved. Google Hangouts 15 Creative Ways to Get The Most Out of Google Hangouts 15 Creative Ways to Get The Most Out of Google Hangouts These creative ideas for Google Hangouts can be used to enrich your life in all spheres – whether you're working, relaxing, communicating with family, or trying to pick up a new skill. Read More will still exist for the time being. Meanwhile, Hangouts Meet is available right now, and rolling out to G Suite customers over the next few weeks. Hangouts Chat is still in development, and so will only be available through the Early Adopter Program for now. This is all a little confusing if we’re honest. Google obviously wants to appeal more to enterprise customers with Hangouts Chat and Hangouts Meet, with us ordinary consumers being steered towards Allo and Duo. But we can’t be the only ones losing track of everything on offer. 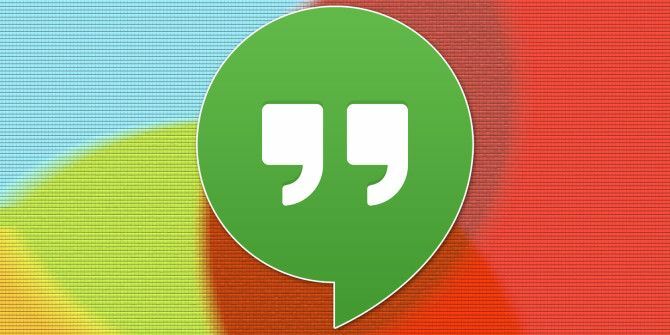 Do you currently use Google Hangouts? What do you think of Google dividing Hangouts into two distinct apps? Are you likely to use Hangouts Chat? Or Hangouts Meet? Or both? Or neither? Have you ever used Allo and/or Duo? Please let us know in the comments below! Explore more about: Google, Google Hangouts, Instant Messaging, Video Chat / Call. Why Google? Why?? The stuff in these new apps is the same stuff that we already had in the current app. There's no reason to split them up! Good gravy Google, make up your damn mind... I like Hangouts just fine the way it is! Frankly, having used Google talk, buzz, and now using hangouts instead of Skype, I am disappointed at having to migrate again. Whatsapp seems a good replacement, especially with encrypted conversations.